Here's a little glimpse of the "before and after" happenings in our dining room. It is still a work in progress but I am enjoying the transformation so far! 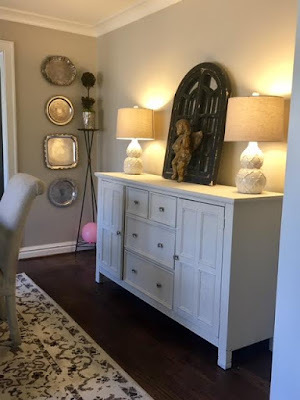 All new trim, hard wood floors and paint color (Revere Pewter, Sherman Williams) were added during the renovation ...I added some chalk paint and mercury glass knobs to the buffet:) This is the first room you see when you walk in the house so I want it to be welcoming and bright! This room was used by previous owners as the living room but I chose it for the dining room because it is a bigger space and I pray that there will be lots of "gatherings" in this area. That was one of my hopes when we moved that I would have a big enough space to host not only dinners, but to have bible study around the table. Food is essential, both natural and spiritual, we NEED both!